Here we are again, back in Greece, enchanted land of weathered baby-blue everything and swarthy fishermen who smack their chests and shout “Opa!,” for another two hours of watered-down soap opera and ABBA karaoke. What did these creators of catchy ’70s Europop par excellence do to deserve not one, but two dull jukebox musicals? The storyline of the 2008 box-office hit Mamma Mia! 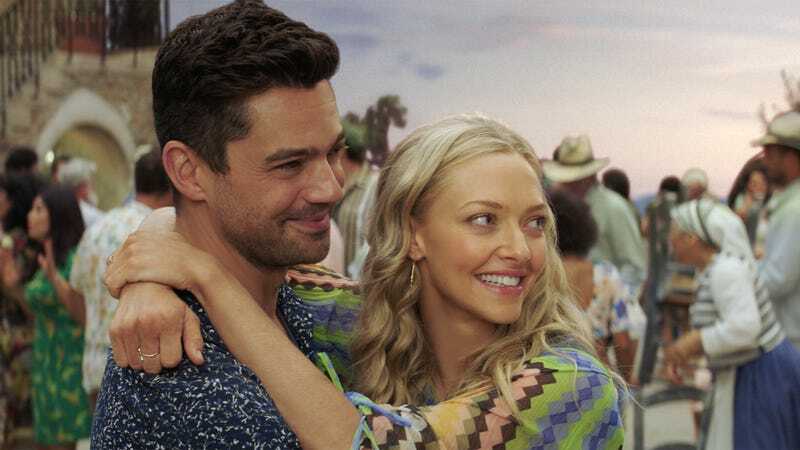 (adapted from the long-running stage musical) barely accomplished its intended task of linking two-dozen ABBA hits into a plot; it had a Greek island setting, a wedding, and a bride-to-be (Amanda Seyfried) who wanted to know which one of her mom’s old flames (Pierce Brosnan, Colin Firth, and Stellan Skarsgård) was her real father. 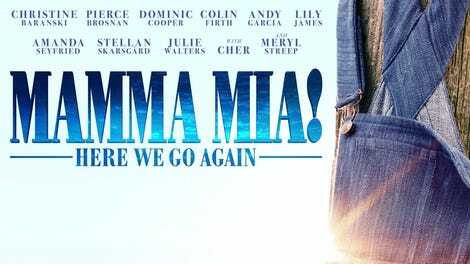 Arriving in theaters a full decade later, Mamma Mia! Here We Go Again, the title of which should be taken as a warning, knows all too well that its target audience wants more of the same. Heck, some of the songs (“Dancing Queen,” “Waterloo,” “Mamma Mia,” “The Name Of The Game,” etc.) are recycled from the first film. They should have called this one Money, Money, Money. As Here We Go Again opens, Sophie (Seyfried) is preparing for the grand reopening of the Greek bed and breakfast left to her by her late mother, Donna (Meryl Streep). (Fans of Streep’s singing voice don’t have to worry: She returns—in ghost form—for a duet and an end-credits dance number.) In fact, it seems that nothing is going right at the newly renamed Hotel Bella Donna: Sophie’s marriage to Sky (Dominic Cooper) is being innocuously strained by a big job offer in New York; her hotel manager, Señor Cienfuegos (Andy Garcia, with a glorious sea-captain beard), senses a thunderstorm; and though Sophie’s three potential dads have agreed to share parenting duties, both the British banker, Harry (Firth), and the Swedish adventurer, Bill (Skarsgård), are unable to make the big day because of prior commitments. The Irish-something dreamboat-architect, Sam (Brosnan), who married Donna at the end of Mamma Mia!, has no such excuse: He lives on the same island. The cast is overqualified (the men seem to get all the fun parts) and so are the songs—even if stripping a total killer like “Knowing Me, Knowing You” of its original vocals and consummate production puts too much focus on the simplistic wording of Benny Andersson, Björn Ulvaeus, and Stig Anderson’s English-as-a-second-language lyrics. Following the lead of the original Mamma Mia!, Parker plays ABBA’s often transcendent and dramatic pop for nostalgic recognition value, and his sole stylistic contribution involves linking shots through overcomplicated digital transitions. His visual style is otherwise static and creaky: Most of the musical numbers are hard to tell apart, and the idea of a Napoleon-themed “Waterloo” number is pretty much the opposite of creative staging. Not even an instance of Cher ex machina—with the queen of concert residencies literally flying into the finale as Donna’s estranged mom, her first movie role since Burlesque—can save the film from its lack of personality.